2016 — The World Health Organization (WHO) develops detailed criteria that health care workers can follow to determine which contraceptive methods are medically suitable for their clients. These criteria are based on the most current scientific knowledge about the effectiveness, risks and benefits of various family planning methods, and they can help providers guide their clients in making safe and informed decisions. WHO periodically revises the criteria in response to recommendations made by an expert working group in response to new research findings. 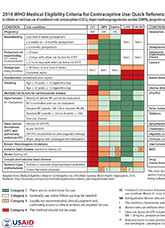 FHI 360 created a quick reference guide, in the form of a chart, that summarizes the WHO medical eligibility criteria for combined oral contraceptives, the injectable contraceptive depot-medroxyprogesterone acetate (DMPA), progestin-only implants, copper intrauterine devices or a levonorgestrel intrauterine system (LNG-IUS). The 2016 version of the Medical Eligibility Criteria Quick Reference Chart includes a complete list of all conditions that WHO classifies as Category 3 (usually not recommended) and Category 4 (should not be used). This document is available in English, French and Spanish.